Robot Squad Simulator is one of the latest in the batch of games released by PlayWay, the publisher behind Giant Machines 2017, Demolish and Build Company 2017, and various other titles, many of which were released in the last few weeks. Like the other titles by PlayWay, Robot Squad Simulator 2017 looks great visually and falls into a niche market of the obscure, yet curiously fun games. I didn’t know I needed to play a robot rescue/treasure hunting game until I heard about Robot Squad Simulator (RSS). In fact, there are so few games in this genre, that it provides a fresh gameplay experience. RSS is a bit light on storytelling, but follows a handful of different scenarios ranging from a downed helicopter to anti-terrorism, to cave dwelling, and even treasure hunting. With 8 training and 16 story missions, the game is around 8 hours in length, which is just the right amount to master its controls and not drag on the end. With each simulation, you pilot one of four robot drones including an EOD robot, a spy robot, a quadcopter, and a submarine. While the missions initially seem sporadic and disconnected, they gradually build upon each other, and eventually, you’ll be required to utilize each of the drone’s unique features in order to collaborate and reach a single objective. 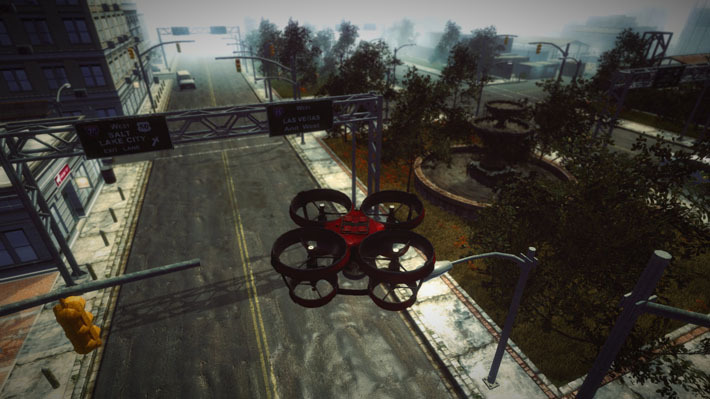 Several tactical first-person shooters have implemented remote controlled robots in the past, but none have gone to the extent that RSS does by turning the totality of your experience into a simulation, with all the intricate movements and frustrations that come with remote-controlled vehicles, albeit with much better battery life. For each type of robot, there is a tutorial course in which you’re taught the ins and outs of the robot’s special abilities and how to move around your environment. Each of the four robots offers a unique playstyle that consistently adds a new layer of strategy. The robot animations and the weather effects in each environment look fantastic, and the rain effects are on par with AAA titles out there. The many environments also compliment the variety found with robots, from the lush foliage covered beaches of the underwater levels to the frozen peaks of the mountain rescue levels, the game looks good in just about any climate. 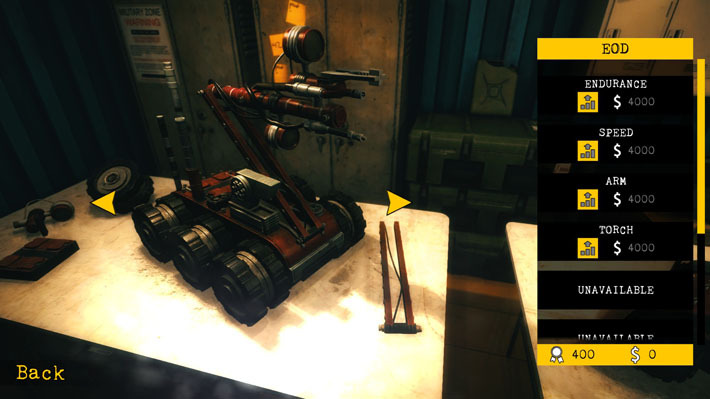 I’m somewhat torn on the actual gameplay of RSS because I often found myself getting stuck in situations where my robot couldn’t move or, that he'd get hung up on garbage. Several times I had to revert to the last checkpoint. I do assume they’re a fact of life when it comes to operating robots with a remote control. When reviewing a game titled Robot Squad Simulator, I can’t complain when a strong gust of air takes out my quadcopter or when my EOD is rendered incapacitated by a large rock or steep curb. In fact, the environment in its design does a good job at leading you toward the objective, while still requiring a slight degree of strategy in robot maneuvering, especially in light of the many obstacles like trash, alarm systems, and guards, you'll find along the way. The simulation aspects are one of the areas where I feel this game shines. When navigating, you must plan out the angle and movement of robotic arms or the directional positioning of your quadcopters; it very much feels like you’re operating these robots like you would an RC vehicle. It’s the same simulation aspects that can make for a frustrating experience when you struggle to line up your clamps with a bomb, but again, I’d attribute the difficulty to a fact of life that any RC hobbyist would know. There are some aspects of the game that I felt were overlooked. First, the actual defusing of bombs and cutting of wires/fences is too basic: it involves nothing more than the click of a button, and the scenes have weak sound effects and lack animation. Luckily these instances are few and far between, and in no way do they take away from the rest of the game. Overall, Robot Squad Simulator offers a unique gaming experience that bridges the gap between simulation and arcade in a relatively unexplored genre. Between its good looks and innovative gameplay, there's a lot to like. A worthwhile purchase, if you’ve ever wanted a solid tactical robot game.